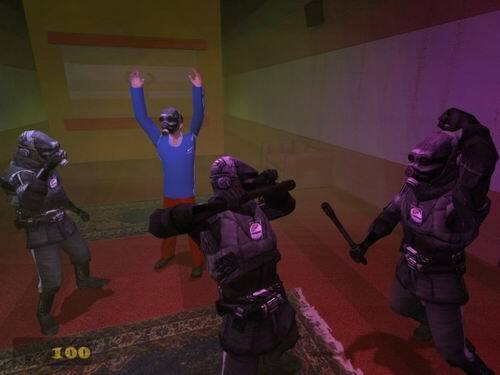 DayHard is a hilarious Half-Life 2 mod, which combines both humor and challenge. Despite its hilarity, this game is really tough. It almost seemed like I got stumped on every stage (for a short time). I love to see puzzles in first person shooters, and this mod does it perfectly, and with style. Another great aspect that fits in with this game is the occurrence of "secret areas" which could also could be a reference to games like Duke Nukem 3D which featured many secret areas. Actually, you can see quite a few of references in this game to other video games and to popular culture, most of which is recorded on my References page. This game features great voice acting, but fails in some parts where the voices don't sound fluid enough. Part of that could be blamed from the re-use of certain sound files, such as phrases like "Whatever". Overall the voice audio is very well done and even the use of the original voices from Half-Life 2 was in some parts very hilarious. The map design is overall very well thought out and conceived, although many glitches and bugs are common, since most areas are well opened. Large opened areas tend to be more prone to things like this. Such glitches include: jumping down window sills, and entering rooms which you shouldn't be in yet, thus producing malfunctioning triggers (enemies don't spawn properly, but appear invisible, until you hit them). These things are fixable though, and probably will be fixed eventually in future patches, although it looks like the development has stopped. My overall impression is somewhat different from my main thought (which is: I LOVE THIS GAME!). The game gives away an unpolished feel, because some of the glitches, choppy voice acting (not a lot though), and some of the loading problems that occurred to other people when playing this game (I actually didn't get any, but the public opinion counts as well). Although, I have to say this game is looking a lot better in the current patch (patch 3b). It really does polish the game up more. If you want to get the most out of this game, I suggest you read my References page and watch or play some of the movies and games listed there. You won't be disappointed with the comedic references to be found in this game.